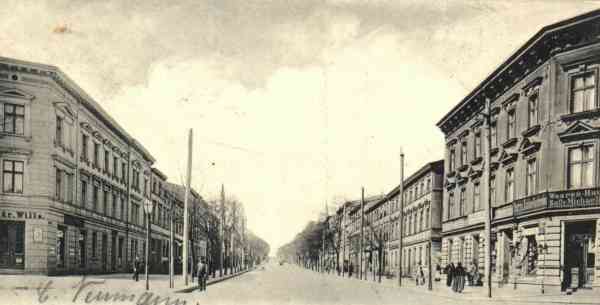 In February 1901 began the building of the trolleybus overhead network in the Eisenbahnstraße. The trolleybus overhead network was laid in 7 m height at masts from wood, at which transverse wires with 1200 kp of stress were attached. The contact wires had a distance of 300 mm and consisted of copper with a diameter of 8 ¼ mm. The foto show the trolleybus overhead network of the first Eberswalde trolleybus in the Eisenbahnstraße near the crossing Zimmer-Straße in direction to railway station. Very well one can detect the 7 m high masts from wood. The depot of the first Eberswalde trolleybus line was in the Zimmerstraße in direct proximity of the urban gas works. Except for some private people of positions still no general current supply was available in Eberswalde. Directly beside the depot was established a 36 HP strong suction gas engine, which was propelled with town gas, for the current supply of the trolleybus net. This suction gas engine was coupled over a belt drive with a compensation generator of 24 KW of performance. The suction gas engine had been manufactured by the company A. - G. Dresdner gas engine factory and the compensation generator of the Karlsruher society for electrical industry. After the construction of the trolleybus overhead network extensive test runs took place. On March 12th, 1901 the first test run was executed in the Eisenbahnstraße. Further test runs led successive on March 13th, 1901 up to the crossing Eisenbahnstraße/Blumenwerderstraße and on March 14th, 1901 up to the state railway station. Starting from March 15th, 1901 regular test runs took place. They served for the training of the employees and for the habituation of the environment to the new vehicle. 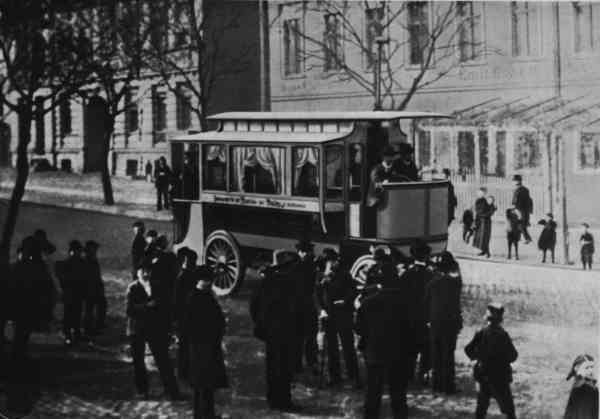 On March 18th, 1901 the trolleybus network was presented to 60 specialists from politics and economics, traveled from Berlin. 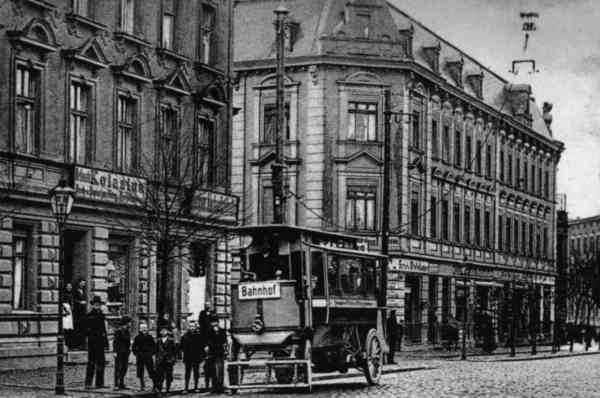 On March 22th, 1901 was the start of working of the the first trolleybus line in Eberswalde. The first trolleybus line was in use between 08:00 o'clock and 22:30 o'clock. The travel without stop cost 10 Pfennig and took 2 minutes. Thus this trolleybus was twice as fast like the horse buses at that time. The test range was always property of the company GANZ Budapest/Hungary, which had bought the selling for Europe from the technical designers. 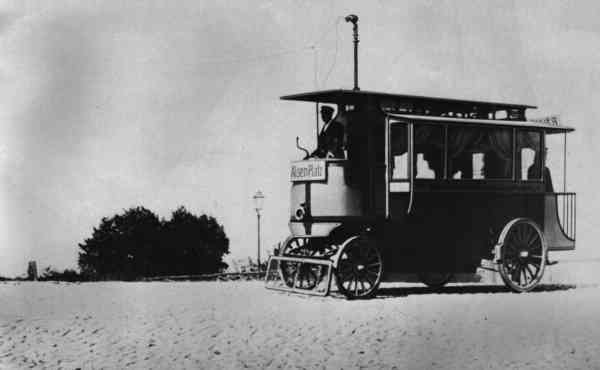 The first trolleybus was already in use on the world exhibition in Paris 1900 and arrived Eberswalde after termination of the world exhibition. The vehicle belongs to the Compagnie de Traction par Trolley Automoteur. Primary the first trolleybus was a horse bus, which had been already built in 1869. The vehicle achieved a speed of travel of 12 km/h. The gas engine actually had not yet the stability at this time to continuous operation. The operation of the gas engine was influenced also very much by the strongly varying gas supply. In the original the car body of the trolleybus was supplied with hard rubber tyres, which however did not perform the demands of trolleybus traffic. Some times later the car body of the trolleybus was supplied with iron tyres. The iron tyres was also not the solution of the problem. Lack of the trolleybus contact line system. After reduction of the trial trolleybus system in Eberswalde the same trolleybus system was structured again in the year 1902 in Copenhagen/Denmark and sent likely afterwards to Hungary (K&K monarchy) to the company GANZ. The foto show the first Eberswalde trolleybus near the crossing Eisenbahnstraße/ Wilhelm-Straße in direction to Alsen-Platz (today: Karl-Marx-Platz). The foto show the first Eberswalde trolleybus after the crossing Eisenbahnstraße/Zimmerstraße in direction to the state railway station. On top right the foto show the supply line to the electric contact trolley and also the electric contact trolley.